At Summers-Knoll, we know what learners need to succeed. Teachers switch between multiple modes of instruction to more effectively scaffold students’ learning. Students develop the mental capability to solve complex problems, explore real-world dilemmas, and discover their strengths, passions, and purpose. And Summers-Knoll’s community of dedicated, veteran instructors bring joy, thought, and tested insight to every class and lesson. But this kind of flexibility is only made possible by a set of strong core education values. At Summers-Knoll, those values are reflected in the school-wide curriculum. These core values allows instructors to tailor education paths to fit each student. Those same values also allow students to authentically engage topics that are relevant to their own lives, empowering them to more effectively pilot their education and make a difference in the world around them. Read the Summers-Knoll Scope and Sequence. At SK, students work in teams to solve real-world problems, document research projects, and explore literature. This approach encourages problem solving, risk taking, creativity and resilience. Project-based learning is the backbone of the SK classroom. At SK, students’ education doesn’t sequester them from the outside world—it connects them to it. From learning the species names of the trees in the copse next door to research trips to radio stations and historical sites, students at SK explore the world around them to unlock its secrets and develop a sense of personal responsibility. 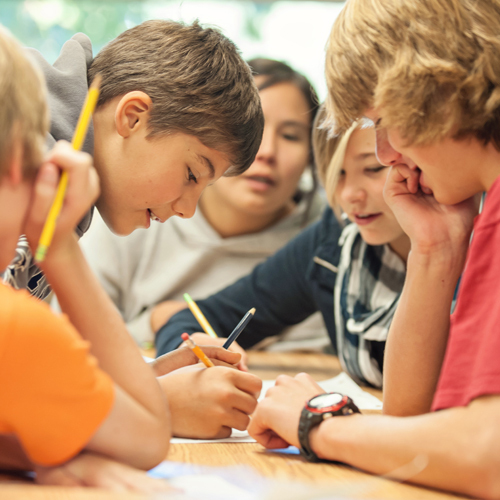 Themes connect topics from drama to physics, from oceanography to language arts. Each theme is a platform for developing topical mastery, intellectual curiosity and community awareness.